Yaquina Head Light House ...the tallest on the Oregon Coast. The 93-foot tower is a masterpiece reflecting the original image of the tower. It's considered the oldest building in Newport. The light was first turned on November 3, 1871 serving as a light source for the harbor entrance. Tours are available. As a working light house, it did not last long, the light was invisible to ships approaching from the north. That was a great engineering mistake. In August, 1873 another light house took Yaquina's place. But, this light house was also built in the wrong place. It should have been built at Otter Crest, several miles to the north. 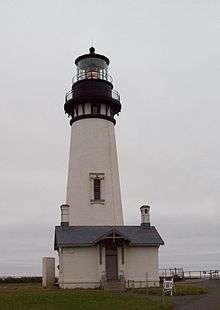 Instead it was built on Yaquina Head now known as the Yaquina Head Light. A light house engineer had originally recommended a location for a light house, at Cape Foul Weather. However, Otter Crest often times was mistaken as Cape Foul Weather. Hence, a myth emerged citing Yaquina Light House was built in the wrong location. The light house was slated for construction at Otter Crest. Mistaking Cape Foul Weather for Otter Crest was common; therefore, the supplier delivered the construction materials to the wrong location. The crews built the light house, unknown to them of the wrong location. According to historical records, this is a myth. The Light House was constructed in the correct location. We hope this clarifies any rumors about the light house and its location. It was March 1871; Congress appropriated the funds for the Yaquina Head Lighthouse. The Light House crew was just gearing up for construction during this appropriation. Construction began in the fall of 1871 right after the construction finished at the Yaquina Bay Light House. This raises the question, "why build a light house in the same vicinity as another light house? Was a light house built in the wrong location?" We explored this issue with the discoveries at the Yaquina Bay Light House. Due to the fall months of construction activity the inclement weather providing construction challenges. Two vessels sank in rough seas attempting to bring construction materials to the site. If one considers all that is lost at sea, the construction of a light house was not cheap. On August 20, 1873, the light was finally lit. It was ready for lighting at the beginning of 1873; however, there was a piece of lens missing. It took several months to get a replacement. Yaquina Head Light House consisted of three keepers. The families shared the living quarters. The structure took its toll from the weather, siding blew off, leaks emerged and windows broke. This was not an uncommon encounter from the Light House stations along the Oregon Coast. They took the brunt of the Pacific storms merely from their locations. People often requested to visit the Oregon Coast Light Houses; however, there were restrictions and unless one had official business they were not allowed. After World War I the restrictions were lifted. Yaquina Head Light House received 10,000 visitors in 1924. The demand was great requiring a schedule for visitors hours and personnel (keepers) to manage the tours. In 1938 Yaquina Head Light House received over 12,000 visitors making it the most visited Light House along the Oregon Coast. In the 30's electricity came to the Yaquina Head Light House. The steady beam of light fueled by flammable liquids was replaced with a safer flashing beacon. The flashing beacon was more prominent for mariners finding their way offshore. The 90's presented the Coast Guard the opportunity to completely restore the Yaquina Head Light House. It's a fabulous visiting area and like all of the Oregon Coast Light Houses, it's worth visiting. The Light House is located just 3-miles North of Newport off of Highway 101. Just follow the signs.